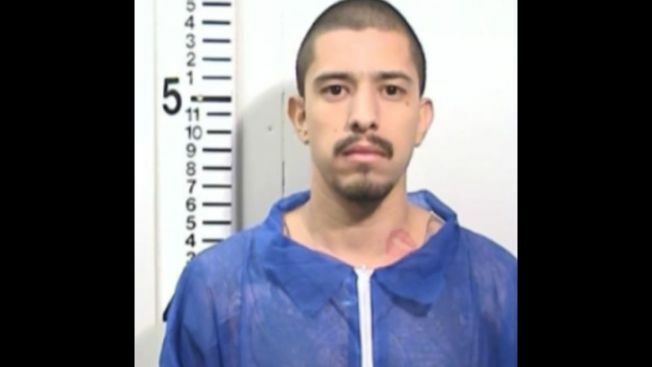 Nearly 15 hours after a riot at a Northern California prison, guards found a missing inmate sawed nearly in two, with his abdominal organs and most chest organs removed, his body folded and stuffed into a garbage can in a shower stall a few doors from his cell. Details of the gruesome May killing at the medium-security California State Prison, Solano, are laid out in an autopsy report obtained by The Associated Press under a public records request. Homicides are distressingly common in California prisons. More than 160 inmates have been killed in the last 15 years, and the state has one of the nation's highest inmate homicide rates. Yet the death of 24-year-old Nicholas Anthony Rodriguez stands out. Rodriguez's missing organs are "still part of the investigation" at the prison in Vacaville, 40 miles southwest of Sacramento, Department of Corrections and Rehabilitation spokeswoman Terry Thornton said Friday. No one has been charged with killing Rodriguez, an Oakland man who was serving an eight-year robbery sentence from Alameda County. However, Thornton said his cellmate, 46-year-old Jesus A. Perez is considered the only suspect and is being held in segregation. Perez is serving a life sentence for a Los Angeles County murder. Thornton said she couldn't say how the homicide was carried out or concealed since it's still being investigated. "It just blows my mind, because officers are looking in on inmates all the time," said Christine Ward, executive director of the Crime Victims Action Alliance. "Unfortunately, we know that there are drugs, there's alcohol, there are weapons. As much as the officers can police that, we know we've got the toughest, the baddest, the most violent criminals in our state prison and unfortunately some of the most cunning prisoners in there as well. They are going to find ways to do that." Rodriguez's body was discovered around 9:30 p.m. May 4, 14½ hours after inmates were ordered locked in their cells following a brawl between 58 inmates in his housing unit. Three prisoners and one correctional officer were injured in the fight, and Thornton said an inmate-made weapon was recovered. She declined to describe it. Despite the riot and resulting investigation, Rodriguez was not discovered missing until a head count at 4:30 p.m. Thornton said officials initially assumed he had escaped. Investigators are looking into whether the riot was created to conceal the slaying or allow someone to move the body. "It's very difficult to cover every contingency with the limited staff that we have," said Chuck Alexander, president of the California Correctional Peace Officers Association that represents most prison guards. "This kind of thing at Solano, sad to say I predict it's just a precursor," he said. He noted a 2011 California law that keeps lower-level offenders in county jails, leaving state prisons to hold the most violent criminals. Changes in prison policies, meanwhile, mean more dangerous offenders are being housed in lower-security prisons like medium-security. Rodriguez had alcohol in his system and was dead before he was eviscerated, killed by blows to the head that left him with a deep star-shaped wound on his forehead among his multiple skull fractures, cuts and other wounds, according to the May 27 autopsy report conducted by the Solano County Sheriff coroner's office. His mother, Maria Rodriguez of Oakland, said she has been given no details about what happened. She said she had not seen the autopsy report but said she knew her son's body was badly injured. "When I saw my son ... at the funeral, he was so bad in the face," she said in a telephone interview. "I called them last week, and they say they're going to tell me in two weeks or in three weeks, but right now we don't got nothing."